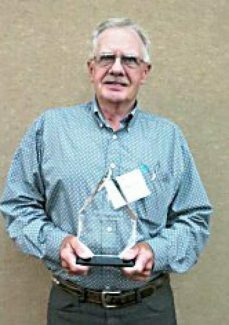 Dr. Sam Holland, Pierre, received the Distinguished Service Award given by the South Dakota Veterinary Medical Association. 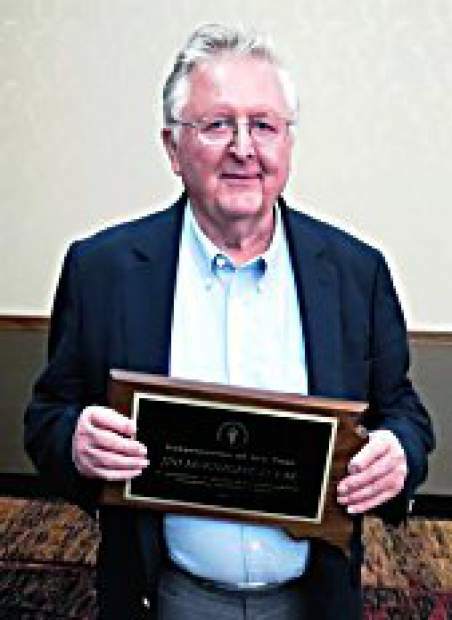 Dr. James McKnight, Brookings, was honored as Veterinarian of the Year at the South Dakota Veterinary Medical Association annual meeting recently. 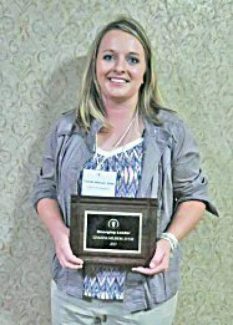 Dr. Chanda Nilsson, Groton, received the Emerging Leader Award given by the South Dakota Veterinary Medical Association. 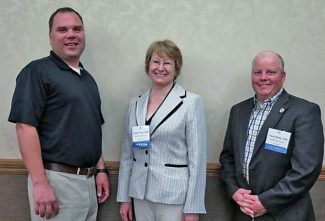 The South Dakota Veterinary Medical Association held its 124th Annual Meeting at the Ramkota Convention Center in Sioux Falls Aug. 9 – 12. The meeting included continuing education opportunities for over 200 veterinarians and veterinary technicians, recognized outstanding accomplishments by professionals in the veterinary fields, and included the annual membership meeting. The meeting featured cutting-edge information on some of the most current topics in veterinary medicine: behavior interventions, the latest on vaccine programs, and neurologic conditions highlighted the companion animal sessions, and antibiotic use and regulations, viral diseases of cattle, and dairy calf management were featured in the large animal sessions. A Tuesday afternoon session featured case reports from the SDSU Animal Disease Research and Diagnostic Lab faculty. Dr. Sam Holland was the recipient of the Distinguished Service Award. Sam was born and raised on a farm in south central Minnesota, graduated from Frost High School, and earned a Bachelor of Science degree with Honors in Agriculture from The University of Minnesota where he also graduated with a Doctorate of Veterinary Medicine degree in 1971. Dr. Holland spent 15 years in private practice. He was in large animal private practice in central South Dakota, and then served as assistant state veterinarian from 1986 to 1995. Sam was appointed as Executive Secretary and State Veterinarian in 1995 and retired as State Veterinarian on March 6, 2009, having served the state of South Dakota's agriculture industry in an outstanding manner for more than 22 years. He is currently serving as the Executive Director for the South Dakota Veterinary Medical Examining Board. In all of Sam's leadership positions, he has demonstrated his considerable knowledge, experience and speaking ability, and also to his great credit, the ability to listen to all sides of a debate and join with others in making rational decisions. •	Developed a chronic wasting disease control program, which became the model for the national program. South Dakota is truly Dr. Holland's home, despite his Minnesota origins. He continues to live in Pierre with his wife, LaVer. He takes great pride in the accomplishments of his children. His son Mikel is a physician in Pierre, and his daughter Cindy, also of Pierre, is a physician's assistant. 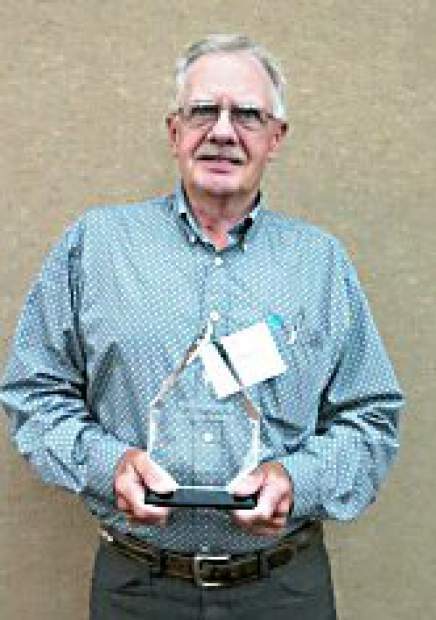 Dr. James McKnight of Brookings was honored as SDVMA's Veterinarian of the Year. Dr. McKnight attended the South Dakota School of Mines for his undergraduate education. He graduated with his Doctor of Veterinary Medicine degree from Iowa State University in 1963. Dr. McKnight served as the SDVMA's president in 1990-1991. He has been active in the Interstate Veterinary Medical Association, serving on various committees and as its president on several occasions. He also served on the South Dakota Veterinary Medical Examining Board. He has been a supporter of 4-H throughout his career and mentored several pre-vet students over the years. His support of veterinary medicine and care for animals has been evident throughout his career. Jim and his wife Connie live in Brookings. They have two children, Matt and Ann, and four grandchildren. Dr. Chanda Nilsson, Groton, received the 2015 SDVMA Emerging Leader Award. Dr. Nilsson's love of animals started very early. As a child she often brought home animals to care for. She had pet raccoons, parrots, dogs and any other animal in need of shelter. 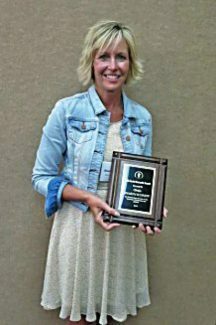 Dr. Nilsson graduated with a bachelor of science degree from North Dakota State University and earned her veterinary degree from Iowa State University in 2011. She is a member of the Groton Veterinary Clinic and is a mixed practice practitioner. Dr. Nilsson was selected as an Emerging Leader of the South Dakota Veterinary Medical Association and represented SDVMA at the AVMA Emerging Leader Conference in Chicago. Dr. Nilsson was elected as the SDVMA District 2 Representative and is a member of the SDVMA Board of Directors. She lives in Bath with her husband, Logan. 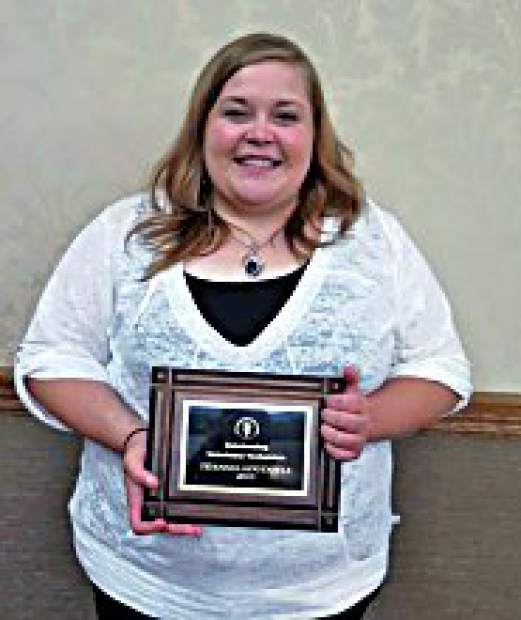 Teanna Aduddell of Rapid City was named the 2015 Outstanding Veterinary Technician. Teanna attended NDSU from 2005-2008 for her Veterinary Technology education and completed her externship at Sturgis Veterinary Hospital under Dr. Larry Carpenter. While at NDSU, she was a research assistant at NDSU Dairy and a teaching assistant for two years in Anatomy, Clinical Techniques, and Parasitology under Dr. Sarah Wagner and Dr. Tom Colville. Teanna is currently a vet tech at Noah's Ark in Rapid City, where she has served since March of 2009. Drs. Jim Bain, Frederick; Peggy Behrens, Rapid City; Keith Schonewill, Sioux Falls; Thomas Stenberg, Volga; and Jim Wasson, Armour; attained life membership status in the SDVMA for their years of practice. Life members have attained the age of 65 and have been members of SDVMA for at least 20 years. Sharon Schnepf, Granville, Iowa, received the Bill Davis award. This award is given annually to a sales representative. Growing up on a farm in Merrill, Iowa, Sharon was no stranger to agriculture. She continued her education at Augustana College in Sioux Falls and pursued a degree in Communications. In 1988, she married Richard Schnepf and they moved to Granville, Iowa to begin Schnepf Stock Farms, raising hogs and grain crops. Over her career, Sharon has held positions at K Products, now Staples in Marketing, Van Beek Scientific, and finally Nelson Laboratories until 2011 which through an acquisition led her to the current sales position with MWI. Her customers have truly become her second family and she values each of those relations. The SDVMA Alliance raised over $9,300 in a benefit auction as part of the event. The money is used for scholarships for veterinary and veterinary technician students. The following board members were elected for the coming year: Dr. Christy Teets, Rapid City, president; Dr. Travis White, Wessington Springs, president-elect; Dr. Michelle Jensen, Harrisburg, vice president; Dr. Mark Braunschmidt, Sioux Falls, secretary-treasurer; Dr. Angela Anderson, Sioux Falls, District 1 representative; and Dr. Chanda Nilsson, Groton, District 2 representative. Other board members are Dr. Ethan Andress, Hettinger, ND, District 3 representative; Dr. Chris Chase, Brookings, AVMA delegate; Dr. Cindy Franklin, Yankton, AVMA alternate delegate; and Dr. Todd Carr, Sioux Falls, past president. The 2016 SDVMA annual meeting will be Aug. 17 – 20 in Rapid City.